Sports projects tend to be all about teams. Not just in terms of who is playing on the field, but also the many different entities that each take on a different segment of the work. Of course, this makes sense where varying departments are involved—concessions probably shouldn’t be handled by the turf guy. But there has been a merging of some formerly fairly distinct teams on the technology side as the overarching focus on fan engagement draws more forms of media and technology together. Panasonic installed the largest 4K video board in the world at Churchill Downs, home of the Kentucky Derby. Now the Wi-Fi team is hanging with the AV team, which is hanging with the video production team, which is connected with the social media team, and probably a few other teams in between. They’re all one division now, which makes sense when you’re trying to simultaneously recreate and reinvent the at-home sports viewing experience in the stadium. You have to offer everything a fan expects at home, and then you have to change it up just enough to persuade them to leave home with a compelling game-day experience. Google “high-tech stadium” and Levis Stadium probably comes up in the top search results. Partially because it’s in Silicon Valley, and sponsorship deals from blue-chip tech firms meant that infrastructure was first and foremost in the blueprint for the place, and also because it really was one of the first sporting venues to see past the scoreboard to all the tiny screens in the hands of fans. 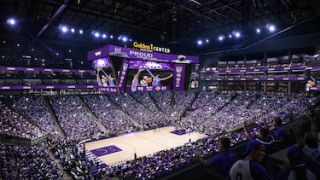 Panasonic is installing the NBA’s first 4K center-hung video scoreboard in time for the start of the 2016-17 season at the Sacramento Kings new Golden 1 Center. At 84 feet long, the total structure is seven times larger than the previous scoreboard. One of the teams on board to integrated audio and video at Levis Stadium was Pro Media/UltraSound. The company, and its stadium whisperer COO Ted Leamy, worked on that and countless other new builds and retrofits within the sports world. Working alongside and with Pro Media/UltraSound on some of those mega sports projects was a little company called Panasonic. You may have heard of them. Well, the good people within the Sensory Solutions Group (SSG) at Panasonic Enterprise Solutions Company (PESC) have their own stadium whisperer in executive vice president Don Szczepaniak. Somewhere along the way, Szczepaniak and Leamy, and the teams at Pro Media/UltraSound and Panasonic got to collaborating, and then, as the latter became more focused on building out its integration capabilities to fully address the new fan engagement era in sports, well, an acquisition happened. This past June, announced on the first day of InfoComm 2016, Panasonic added Pro Media, along with Leamy and his team, to a roster that also includes two other recent acquisitions, fabrication experts TS Sports and small-screen gurus Magic Ink. “Pro Media was our third acquisition this year, and it won’t be our last,” Szczepaniak noted, describing Panasonic’s vision for what it has aptly termed the “Live Events” segment. Because sports is now much bigger than the venue. It’s about entertainment, food and beverage, and logistics across the neighborhood around a stadium, in addition to social media channels and broadcasting efforts.